You can throw out all your over-the-counter heartburn pills, Pepto Bismol, Mylanta, Gas-X, and more… because essential oils can get the job done! That's right — if you have gut discomforts like gas, bloating, indigestion, or pathogenic overgrowth — essential oils to the rescue! Diet plays a huge role in the health of the gut, of course, but it's not the only factor. Stress, anxiety, water quality, antibiotics, birth control pills, and more also play a part in gut health. We recommend the GAPS Diet to address leaky gut and especially severe gut issues like autoimmune disease, seasonal allergies, and food sensitivities. 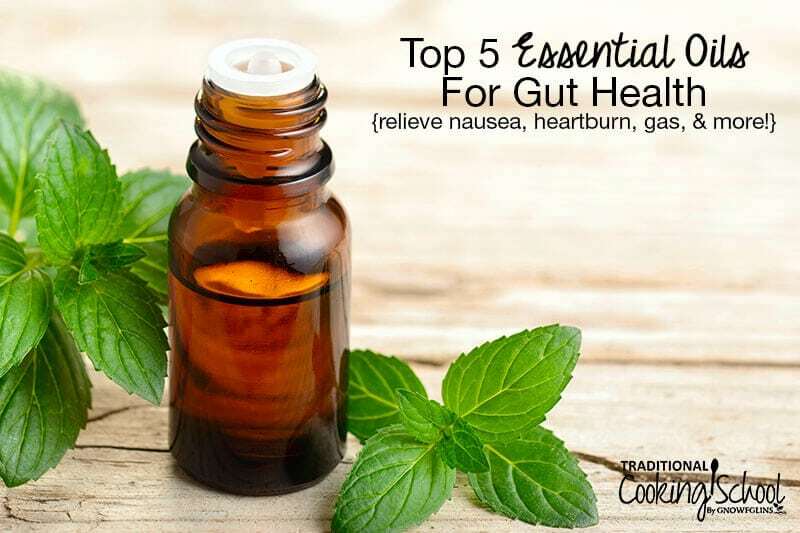 However, there are other helpful tools to keep in your “Gut Healing Toolbox”, too — such as supplements and lifestyle changes… and essential oils! 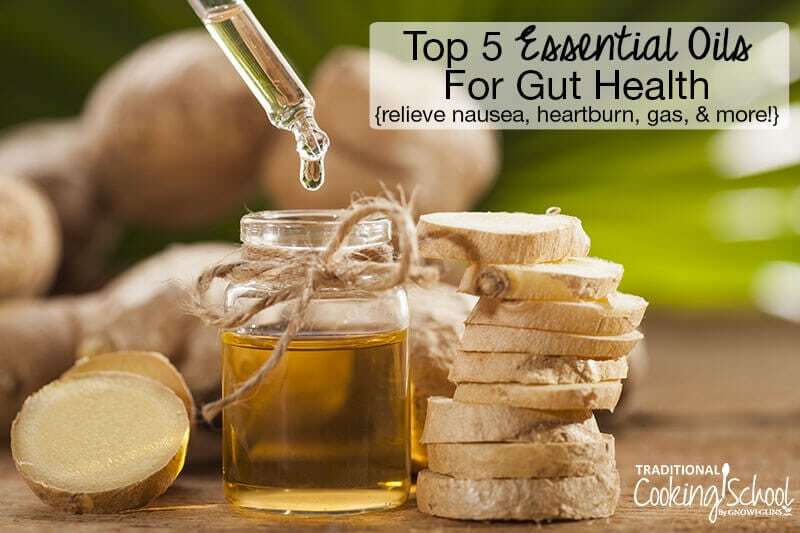 Here are the top 5 essential oils for gut health. While these won't heal the gut alone, they are very useful if you are working on your gut health. If you've ever eaten peppermint candy after a meal to stimulate digestion or relieve the bloating of over-eating, then you already know that peppermint is a top choice for gut health. Peppermint‘s gently stimulating, cooling properties are effective against many digestive complaints. Peppermint oil is especially effective at relieving nausea, whether inhaled, rubbed on the stomach, or taken internally. Because of peppermint's ability to refresh, stimulate, tone, and settle the digestive system, it is the “ultimate internal body workout” (source). So, what types of digestive complaints can peppermint essential oil relieve? Maybe the better question is, what digestive complaints can't it relieve?! In fact, one study showed that peppermint oil had a beneficial effect on the balance of gut bacteria in a case of SIBO (small intestinal bacterial overgrowth) (source). Peppermint oil can be used topically, aromatherapeutically, and internally. Rub a drop, undiluted, over the abdominal area for relief from cramping, bloating, gas, indigestion, and more. For halitosis, place a drop of peppermint oil on your toothbrush, and brush as usual, twice per day. You can also add peppermint oil to a capsule and take it internally. To help with nausea around the clock, diffuse peppermint oil. Or put an inhaler in your purse. Peppermint can also be combined with other digestive-friendly oils, such as lavender and ginger. Do NOT add drops of peppermint oil to water. Oil and water don't mix, and this isn't a safe or effective way to ingest essential oils. Check with a certified aromatherapist before using peppermint oil if you are pregnant, nursing, or using it for children, as peppermint oil is contraindicated for certain ages and conditions. Clove essential oil is a powerful antibacterial and anti-fungal oil, making it ideal for treating stomach illness and pathogenic overgrowth. For these reasons, it is useful against harmful gut bacteria such as E. coli and pathogenic yeast such as Candida albicans. Clove oil contains high amounts of eugenol — a compound that has been studied for its antiseptic and anti-inflammatory properties. Found in other plants and essential oils, like nutmeg, basil, and oregano, eugenol is most concentrated in clove essential oil. Eugenol is also a powerful anti-fungal for internal yeast infections. Published in the journal Oral Microbiology & Immunology, a study was conducted to see how clove fared against other anti-fungal treatments and observed that it was as effective as nystatin, a drug commonly prescribed to manage yeast infections of the mouth (thrush), which has a slew of ugly side effects. Always dilute clove essential oil with a carrier oil, such as jojoba or coconut oil, as it is a hot oil and can burn the skin. To take clove essential oil internally for a Candida or parasitic infection, add 1 drop of clove oil to a gelatin capsule along with a bit of coconut oil. Eugenol is a fat-soluble substance, so the coconut oil will help with absorption and also keep the oil from irritating a sensitive digestive system. Take 1 to 2 capsules of clove oil daily for up to 2 weeks. Always work with a qualified practitioner or aromatherapist when taking oils internally. Unlike other essential oils, lavender essential oil doesn't appear to harm beneficial gut bacteria. Essential oils are powerful plant medicine with super-concentrated properties. It doesn't matter what “therapeutic grade” or brand you're using — most essential oils have antibacterial properties. And like prescription antibiotics, the oils don't know the difference between pathogenic bacteria and healthy gut bacteria. Therefore, do not use any oil internally long-term, unless directed by your practitioner. 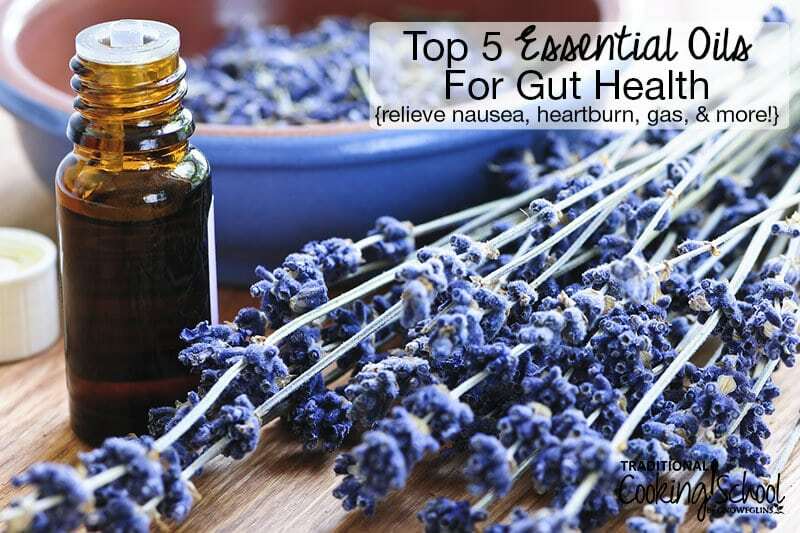 Lavender, however, does seem to “know” the difference between harmful and healthy gut flora! Or at least, lavender oil seems to “harmonize well with the beneficial bacteria in the body” (source and source). Still, ingestion should be more of a last resort than first choice. 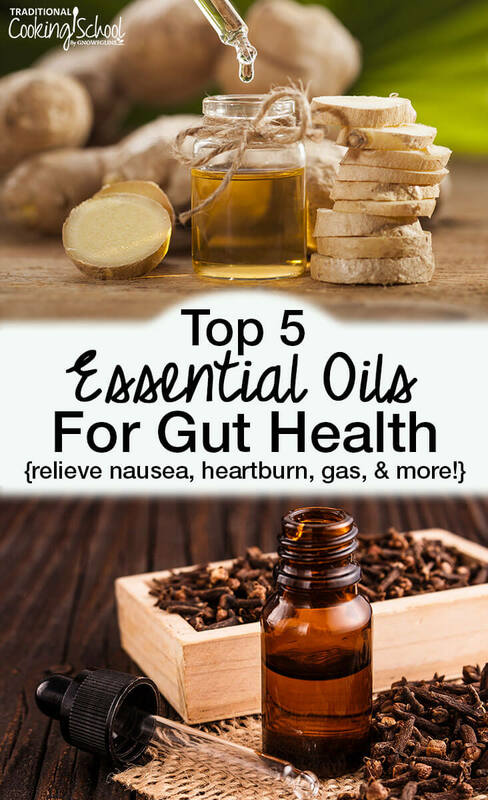 Even without ingestion, essential oils are still very effective against digestive complaints. Inhale lavender essential oil straight from the bottle or diffuse. Or make an inhaler for your purse. Use lavender alone or with other essential oils for gut health, such as peppermint and ginger. Apply lavender NEAT to the abdominal area, or dilute with a carrier oil, such as jojoba or coconut oil. Calm an upset stomach by adding a few drops of lavender oil to a hot bath. Add a drop of lavender oil to a gelatin capsule along with a bit of coconut oil and take once per day for up to 2 weeks. Always work with a qualified practitioner or aromatherapist when taking oils internally. Perhaps one of the most potent anti-viral and antibacterial oils, oregano essential oil is definitely one to keep in your arsenal for gut issues. And, although there are over 40 varieties of oregano, only 2 are effective for healing: Origanum vulgare and Thymus capitatus . In 2011, the Journal of Medicinal Food published a study that evaluated the antibacterial activity of oregano oil against five different types of bad bacteria. After evaluating the anti-bacterial characteristics of oil of oregano it showed significant anti-bacterial properties against all five species. 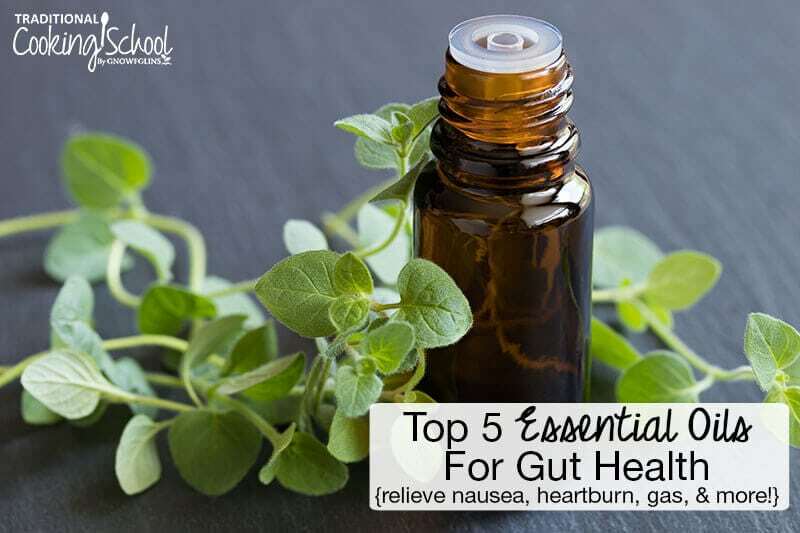 The highest activity was observed against E. Coli, which suggests that oregano oil could potentially be routinely used to promote gastrointestinal health and to prevent deadly food poisoning. It can also be used to treat giardia and MRSA (source). Do not take oregano essential oil internally for more than 10 days. Overuse can kill beneficial gut bacteria and cause liver toxicity. Take up to 4 drops, 4 times daily, in a gelatin capsule with added coconut oil to prevent burning. You can do this for Candida or bacterial infections in the gut or to fight off colds and the flu. Beware: you may have “oregano burps” after taking oregano essential oil internally. Although it's not the best scent, diffusing oregano oil is a great way to reap its benefits while preserving the integrity of your gut flora. Always dilute oregano oil before putting it on your skin, as it can burn or irritate the skin. Always work with a qualified practitioner or aromatherapist when taking oils internally. Ginger root has been used as a natural remedy for stomach complaints for millennia, so it's no surprise that ginger essential oil would be one of the top oils for gut health! In fact, the Chinese and Indians have been using it for over 4,700 years! Ginger essential oil is effective against nausea and vomiting, indigestion, diarrhea, and stomach cramps. Ginger oil has also been proven to relieve post-surgical nausea which would usually require anti-nausea medications (source)! For nausea, diffuse ginger essential oil alone or with other gut-healthy oils, such as peppermint or lavender, or apply 1 to 2 drops NEAT over the stomach. Add ginger oil to bathwater to help overall digestion, or to cooking recipes that call for ginger. Just be sure to add it right before serving to preserve the most benefits. Learn more about cooking with essential oils. 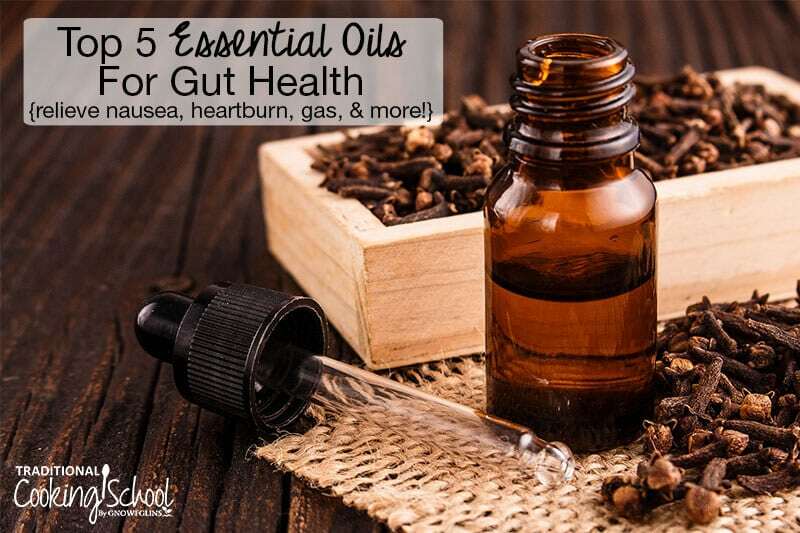 Do you use essential oils to help with gut health? Do you use an oil that isn't on this list? Please share! Oh my, I’ve been putting citrus (of one kind or more) to my water for years. You say it isn’t safe…okay, I’m stopping. And now that you say that water & oil don’t mix…we all know that, right? However, for some reason (unbeknownst to me)…somehow, I didn’t apply that to EO’s and drinking water. What does it do to someone who has been putting it in their drinking water…often?